Burrata is a fresh Italian cheese that is essentially a shell of mozzarella surrounding a core of sweet cream. It can be made with either water buffalo or cow's milk and has a smooth, slightly tangy flavor. A 1-ounce serving of burrata cheese contains 90 calories. This compares favorably to an ounce of cheddar, which contains 113 calories. Switching from an ounce of cheddar to an ounce of burrata every day for a year would result in a 2-pound weight loss. Due to its center of thickened cream, burrata is high in fat, with about 78 percent of its total calories, or 70 per ounce, stemming from its fat content. The rest of the calories come from protein. Burrata contains 4 grams of saturated fat and 20 milligrams of cholesterol per ounce. That's 20 percent of your daily recommended intake of saturated fat and 7 percent of your recommended cholesterol limit. Like most dairy products, burrata is a good source of calcium. One ounce supplies 15 percent of your daily needs. 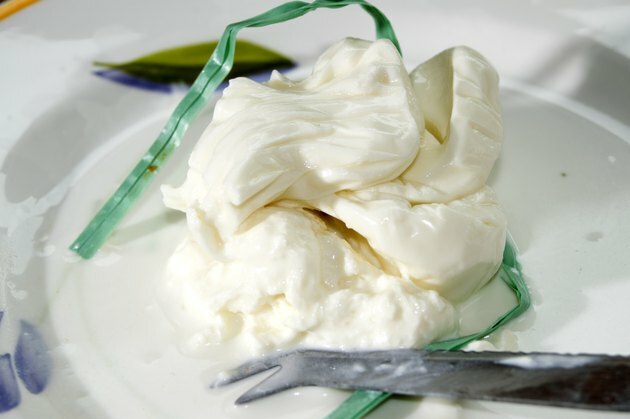 An ounce of burrata also provides 4 percent of your daily vitamin A needs. Is It Safe for Pregnant Women to Eat Velveeta Cheese?